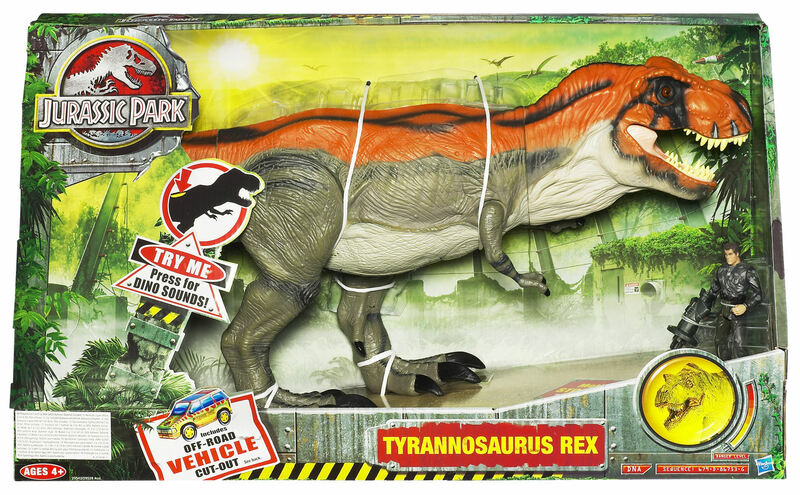 New images of upcoming Jurassic Park Tyrannosaurus Rex have been released. The new Jurassic Park set features the Off-Road JP Tour Vehicle as a cut out. 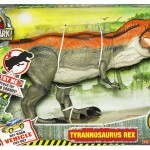 To view the new Jurassic Park Tyrannosaurus Rex click the Title Bar. New images of upcoming Jurassic Park Tyrannosaurus Rex have been released. Pretty cool. I would have preferred the original coloring but he still looks cool. I'd get him to make a Savage Land scene. I am so overjoyed to see that the new Tyrannosaurus for the JP line is the Bull! The coloring is unusual and I was actually expecting a movie-accurate coloration of some kind, but it's a nice color scheme and I can more than live with it. Hope they rerelease a Dr Grant, cant have JP without him. The Toyark coverage of the new JP toyline just barely missed the inclusion of him or the Dino Diver among the other upcoming humans, but we are getting a Grant. A new JP toy? Neat. I'm really diggin' the figure that comes with him...looks to be articulated like Joes! Yeah, these newer figures replaced the older Kenner style when Hasbro made the Jurassic Park 3 toyline. They're not as articulated as 25th Joes or anything, but they're definitely of a similar scale. Their smaller size also makes the dinos, especially big ones like the Bull Rex here, more impressive by comparison. Not as bad as I was expecting, I might pick this up if it ever comes out in Australia. Ah, right on! Thanks for the education, man! Cool. Looks similar to a T-rex I had once. Depending on the price, and whether or not I'm able to find it at the one TRU within somewhat reasonable driving distance, I may get it. Wow new JP stuffs,guess I will be buying this as well.